Delacour: Ghost Town turns Golf Town? 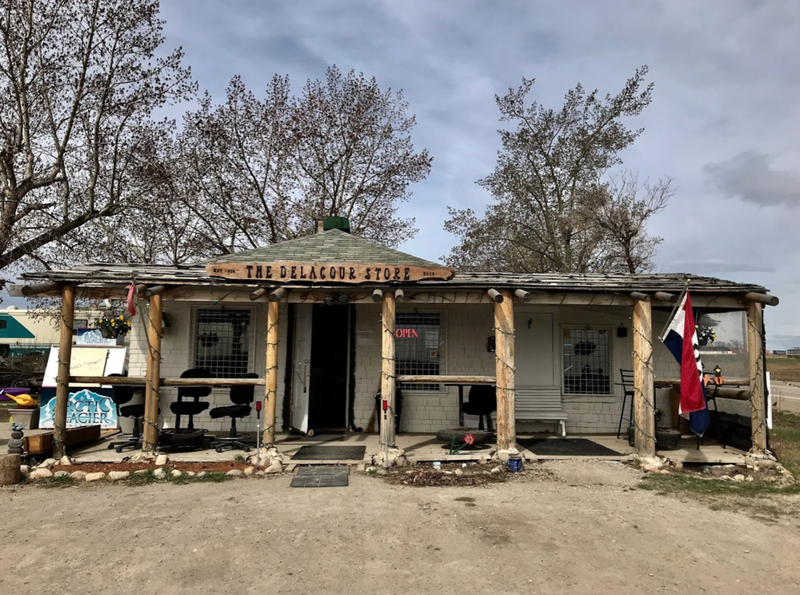 I bet many Calgarians and tourists have whizzed by the Delacour corner at the intersection of secondary Highways #564 and #791 and wondered if the frontier-looking, well-aged tiny wooden General Store building is really still open as the sign says. Or what’s with the Girl Guide building. I know I have. The turnoff to the Delacour Store is well signed, but I have no idea what is the history of Broadway Avenue sign. For the past 10+ years, I have played a couple of rounds at the Canal at Delacour golf course across the street from the General Store/Girl Guide site, but have ever gone in. Until this year. I decided recently to leave a bit early for my tee time and check it out. 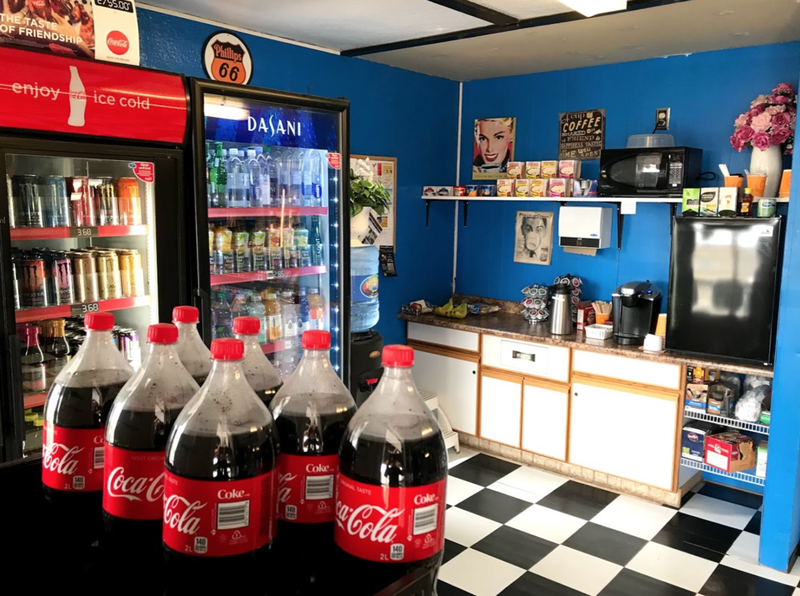 I am happy to report, “Yes, the Delacour General Store is still open” and as you would expect it offers a little of everything. And ”yes,” the Girl Guide building is still used for meetings and a few other functions each year. Upon entering the General Store, I was greeted enthusiastically by the new owners and given a little history and tour of the building. I was then encouraged to wander the site which was a unique walk back in time. Indeed, it was as if time has stood still on this site. The old baseball backstop had me hearing kids screaming with joy as they played ball a hundred years ago. I wish I had brought a bat and ball. I also wondered how long will still be here. Yep, the store looks like something out of a Hollywood western movie from the '50s. 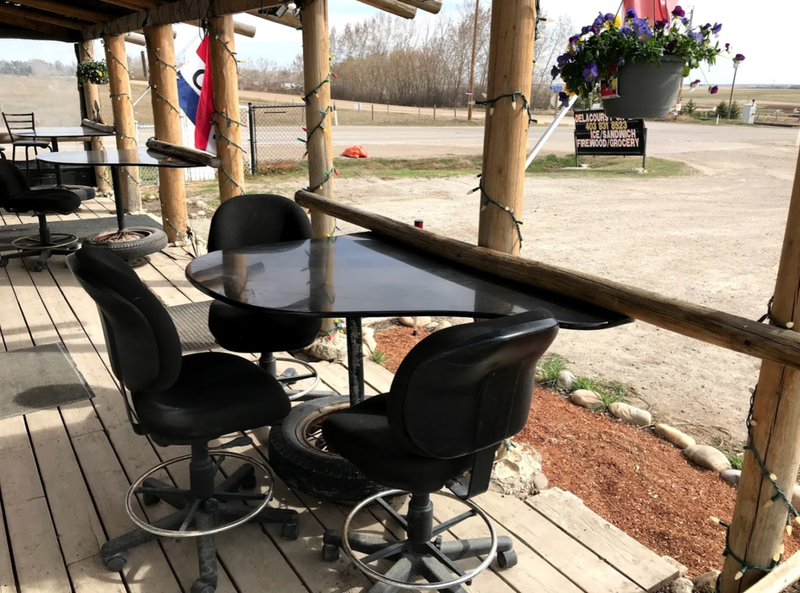 The porch has these lovely tables for anyone wanting to sit and have a coffee or perhaps a Coke and sandwich and enjoy the big prairie sky. The inside is bright and cheerful. This area use to the post office space. Recent renovations converted the living quarters at the back into store space. You can get the staples - milk, eggs, meat, juice and pop. The Delacour was named after the foreman of the Grand Trunk Pacific Railway construction crew. It was originally believed Delacour was a French name meaning “of the heart,” however; recently this has come into question as Mr. DeLacour was from Denmark. The line became part of the Canadian National Railway in 1914, the same year Delacour was incorporated as a hamlet. The first passenger train went through on February 28, 1914, the same year a small store was established in the community. Yes, the same General Store that is still there today. The store also became the local post office in 1915. As the railway moved west, Delacour was built around one of many prairie grain elevators connecting the agricultural community to the railroad. At the same time a canal was built to allowed agriculture to thrive. Though the grain elevator has long since been demolished, an active community is still centred around the Delacour Community Hal in the hamlet of Delacour. The Community Club was incorporated by early residents in 1928, followed by the Agricultural Society - both are still thriving today. The Girl Guide House is still in good shape and used today. The old baseball diamond looks like it hasn't been used in many many years. Today, Delacour has a few old homes as well as some large acreage homes located along the railway tracks and a community center just down the road from the General Store. However, plans to sell residential lots on the golf course could be the catalyst to convert what looks like a ghost town (to the casual observer) into a thriving golf town. The Canal at Delacour, which officially opened for play in 2005, is one of Alberta’s premier championship golf courses. This link style course is one of the first to open in the spring and last to close in the fall. The greens are fast and challenging and the course is always in good shape. 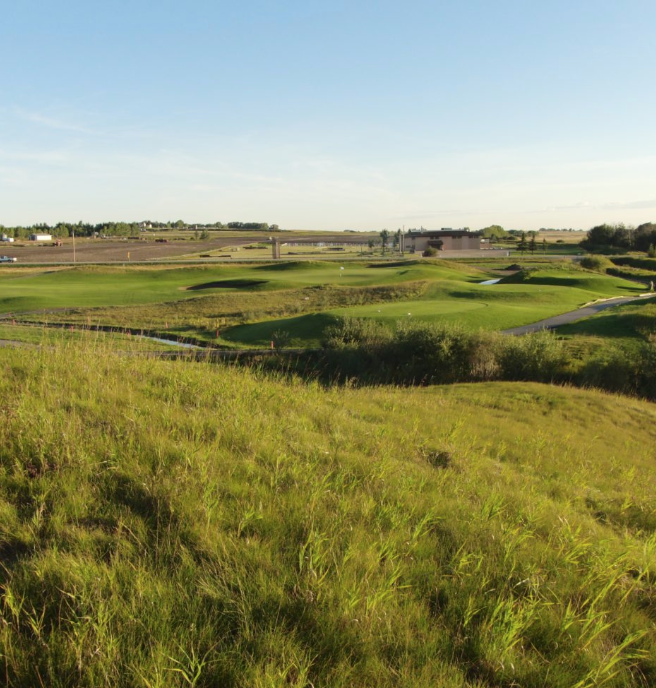 It offers perhaps the best golf for the money in southern Alberta. With Delacour’s easy access to the Calgary International Airport, Stoney Trail and CrossIron Mills Mall, Costco, Walmart and Lowe’s Home Improvement, as well as the Horizon Mall set to open this summer, it could easily become a mecca for Southern Alberta retirees. The Canal at Delacour Golf Course is perhaps the best links golf course in Western Canada and one of the top courses in Alberta. 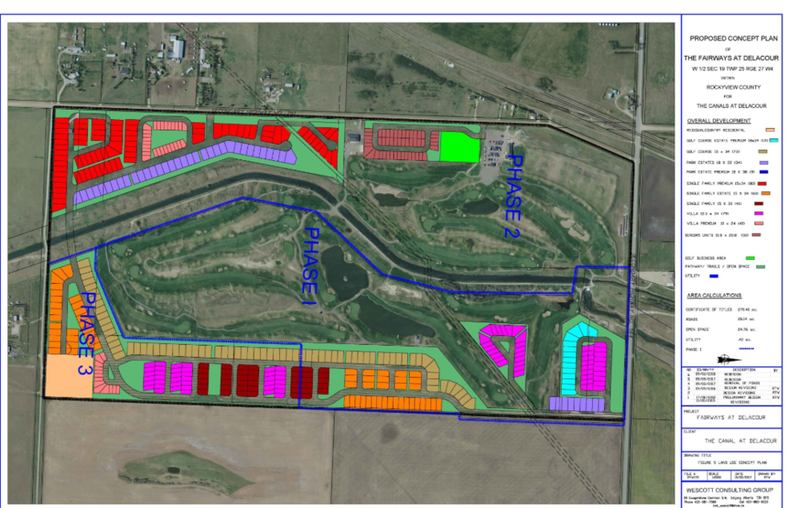 Concept plans for the proposed Fairways at Delacour residential development. Next time you are out and about (on foot, on bike or in a vehicle) and think “we should stop and check out this out,” don’t just think about it, DO IT! You will be glad you did. You gotta like the Hurst gear shifter that has been converted into a door handle for the store.